A wise and experienced investor is one who has knowledge of the must-not-dos in long-term investment. 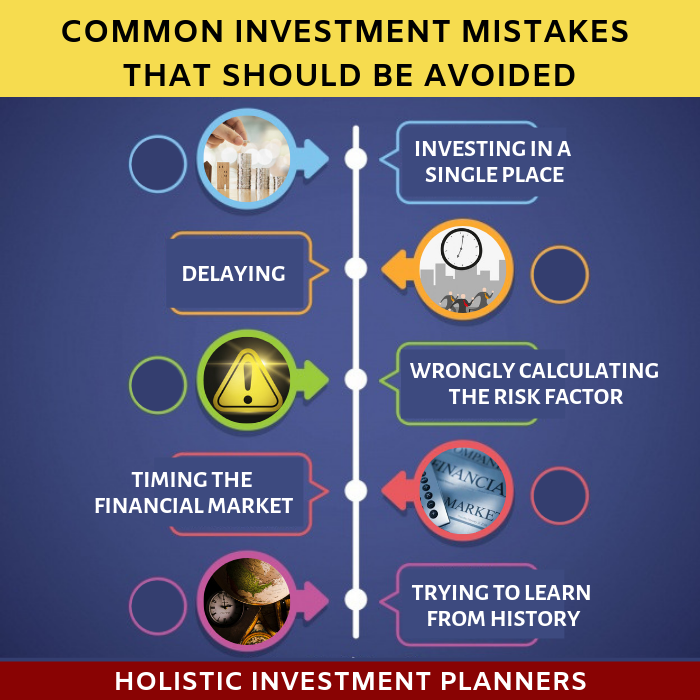 If you are new to this money-making venture, here is a list of some of the common mistakes that investors can end up making. You will also be provided tips to avert such pitfalls. You should not stay put after investing in income-generating instruments with low yields. This is because such yields compound with time, but they are also vulnerable to inflation. You have to balance such low-risk based investment with high-risk instruments like equities and real return bonds. They will give you a mixed bag of risk reduction and growth of returns. Investors should focus on risk-adjusted returns. You will need to allocate the assets carefully and diversify your portfolio to minimize the investment risks. If you keep delaying things, you may end up losing more than what you had anticipated. You may want to wait for the right time for investing your money, but when you intend to compound your interest, you should start as early as possible, even if it is a meager amount. What you need to know is that the market fads of the early 1990s and the late 90s with a craze for tech stocks resulted in nothing but crash! Keep a watch on the market changes but keep your investment commodity close to you till it matures, even if it for a long, long term! There are many investors who believe that their investments will give them great returns and with this over-enthusiastic optimism they put more at stake that they should. The more you can be patient with your investment , the lesser will your risk factor be. However, you have to know long you can stay invested. It could go beyond just retirement. It is fairly possible that your retirement plans are not able to cover your expenses. If you invest in long-term plans, you will be able to bring down the risk factors that may hit you hard in your already-troubled times. Your investment portfolio performance will depend on the right asset class mix. You can select from among these asset classes- equities, fixed-income (bonds) and cash. Each of these asset classes has its own weaknesses and strengths. The specificity in investment from each of these classes will have secondary impact on your portfolio. According to a popular industry statistic, asset allocation determines 90% of what variables you will have on your portfolio returns. If you can opt for diversification, you will be able to reduce the risk associated with your investment portfolio as well as increase your returns. You cannot say for sure that such and such investment, market or sector will go above its competitors at such and such time of the year. You can only invest in high quality assets as securities and stick to them till such time they give you more than just good returns. Once you are able to inspect your views and ideas of investment and replace them with the ones provided above, you cannot think of doing well with your investment and get healthy returns on them. Remember to be patient and gain as much knowledge as you can about the market so that you can keep your investment protected and risk-free. Author’s Bio: Alisa Martin has been authoring articles on investment. She has experience on topics including Investment Immigration for foreign nationals. Great post. I am checking this blog regularly. Really bеneficial. I look forward to coming back again. Previous Previous post: What to do if your claim from mediclaim policy is rejected?